Lugonia was the first school built in what is now Redlands in 1877. Named by County Superintendent Charles R. Paine, the one-room school-house stood on the northwest corner of Lugonia and Church Street. George W. Beattie was the eighteen year-old first teacher.In April of 1935, retired teachers George Beattie and Miss Emma Jackson assembled with the Daughters of the American Revolution, Lugonia PTA, district school board and pioneer students to dedicate the stone monument found on the northwest corner of Lugonia and Church Street. The school served as the first Sunday school location and meeting place for the Congregational Church built later in 1883. In 1909, with much fan fare the new Lugonia School was designed by architect Fred T. Harris and built by Taylor Brothers for $30,500. The Grecian architecture one-story building boasted twelve classrooms, a library, lunch room, assembly room, teachers room, showerbaths, an oil burning furnace, a six pillar entrance and a bicycle room basement. The interior Oregon pine was given a live oak stain. Lugonia residents were bursting with pride but lacked a kindergarten. State Emergency Relief Administration (SERA) money was released to the school district in 1935 to build a Lugonia kindergarten and library complex. Architect G. Stanley Wilson was hired to complete the plans. Wilson’s firm included architects Arthur B.Benton and Myron Hunt. Wilson did the previous plans for the Mission School, Redlands High Girl’s Gym, Redlands Post Office and Riverside projects such as the Mission Inn, Casa de Anza (Riverside Municipal Auditorium), Riverside Carnegie Library and many Mission Revival projects. Superintendent Henry Clement provided the building materials while SERA brought and paid the labor during the Great Depression. The combination kindergarten unit and a branch library was announced for the southwest corner of Lugonia and Orange Street in 1935. T. C. Prichard of Riverside was awarded the contract by Public Works Administration (PWA) authorities in Los Angeles after the low bid was submitted by Superintendent Clement. Prichard promised to subcontract smaller parts of the project to Redlands firms. Prichard and L. P. Scherer had fine reputations for their work on the Redlands Post Office. Charles Milton Brown was a packing house manager, but more importantly he was the PWA manager for Southern California. He lived in Redlands and swayed federal dollars to Redlands often. Spanish Revival architecture is apparent on all sides of the kindergarten. 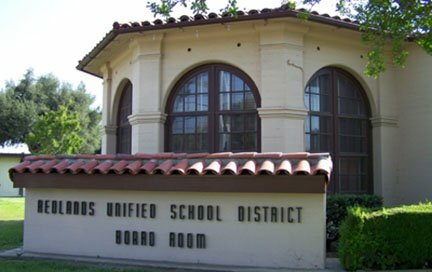 The alphabet letters adorn the interior fire-place mantel and the stage serves as a perfect raised pedestal for the Redlands Unified School Board members. Work was completed in 1937.